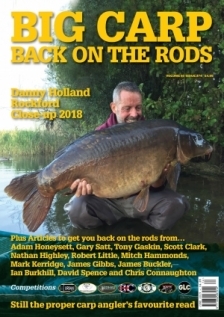 Using our new feature you will be able to search through our ‘back issues archive’ facility for past articles written by our many authors on a huge range of subjects including, rigs, baits, methods and fisheries. Furthermore once you’ve found the article of interest you will also be able to order and pay for that issue via our new online shopping facility. The Scenario: Lets say that you have just managed to get yourself a ticket to fish on CEMEX Angling’s Horton Church Lake and you wanted to read as much information as you can about it. The Solution: Type the word ‘Horton’ into the ‘Search Description’ field. This will bring up a list of articles with authors, issues and volume numbers that have been written about Horton. The Scenario: A mate fishing your local lake told you about a fantastic article he’d read in Big Carp Magazine that helped him catch loads more carp but could only remember part of the tile ‘……Elstow’. The Solution: Type the word ‘Elstow’ into the ‘Title’ field. This will bring up a list of articles with authors, issues and volume numbers that contain the word Elstow in the title. The Scenario: You want read articles written by Lee Jackson because you like his style of writing. The Solution: Type the word ‘Lee Jackson’ into the ‘Author’ field. This will bring up a list of articles written by Lee showing the titles, issues and volume numbers in which they appeared. Please fill out the search criteria below to search our Archive.